A team led by Professor Arne Skerra at the Technical University of Munich (TUM) has developed an innovative strategy for preventing the anthrax bacterium from absorbing iron, which is crucial for its survival. It does so by neutralizing a special iron complexing agent produced by the bacterium. Because the anthrax pathogen only spreads in the body when it receives access to the essential element, this is expected to provide an effective treatment against the life-threatening infection. Anthrax is a disease caused by bacteria. Although the pathogen responsible for anthrax can be treated with antibiotics, the toxin which it releases in the body is particularly dangerous. If the infection is recognized too late, it is often lethal. The anthrax pathogen can survive in the soil for decades in the form of spores. Grazing livestock, such as cows or sheep, ingest the spores and become infected with anthrax. Persons who work with these livestock animals or with animal products may become infected; however, it is very rare for anthrax to occur in animal herds in Germany today. Furthermore, humans may also become infected with the illness if the meat of infected animals is not sufficiently heated. In late August of this year, livestock in the southeast of France became infected with anthrax – the most serious outbreak in 20 years, according to the French media. Populations of chimpanzees and gorillas living in the wild are also endangered by anthrax. Today, anthrax constitutes a global threat primarily due to its potential use as a bioweapon. In 2001, several letters with anthrax spores were distributed in the United States of America. Five people died at the time. Just like any cell in the body, bacteria require the essential trace element iron. However, in body fluids, iron is tightly bound to proteins and, therefore, not easily available. Accordingly, bacteria produce special complexing agents called siderophores (iron carriers) in order to bind the few available iron ions and subsequently absorb them via their own import systems. The human immune system prevents this via a protein that circulates in the blood called siderocalin. It has a high affinity for common iron siderophores and scavenges them, allowing them to be removed via the kidneys. Petrobactin is a peculiar iron carrier produced by the anthrax pathogen which is not recognized by siderocalin. The aim of Prof. Skerra from the Department of Biological Chemistry was to disable this anthrax siderophore, thereby inhibiting the reproduction of the anthrax pathogen. With the aid of Anticalin® technology, which was developed by his department, he and his team were able to reconstruct the body's own siderocalin. The result was "petrocalin," which is able to neutralize the anthrax pathogen's siderophore. 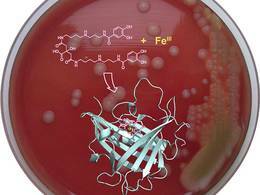 "The newly developed petrocalin captures petrobactin, thereby depriving the anthrax pathogen of access to vital iron and acting as a protein antibiotic," says Skerra. "In collaboration with Professor Siegfried Scherer from the Department of Microbial Ecology, we have been able to demonstrate that this approach works in bacterial cultures." Skerra's strategy opens up a new avenue of treatment for anthrax infections by effectively suppressing the spread of the bacterium in the patient's body. The biochemical and protein structure analyses will be published by Skerra and his colleagues in the internationally renowned journal "Angewandte Chemie", also providing insight into the molecular mechanisms. Rather than the actual human pathogen, a weakened laboratory strain was utilized for the study herein described.